Some people assume that the activity of burning calories must be done with strenuous exercise so that it becomes lazy to start. Whereas to lose weight or just keep it stable can be done through household chores. At home, the daily activities below can provide benefits in the process of burning calories. Starting from outdoor activities or home pages, you can try doing gardening activities. 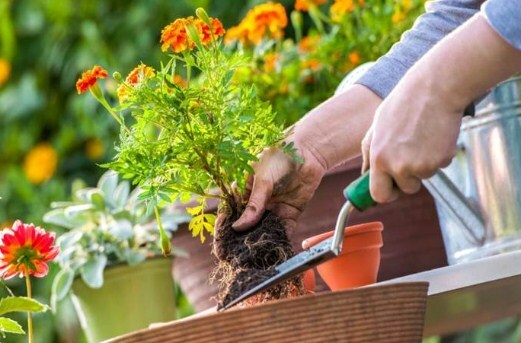 If indeed you like doing this activity as a hobby, then you will be lucky because you can burn around 250 calories per hour or even more with various things to do in the garden; plant, fertilize, prune, weed, water, and others. Looks trivial, actually throwing garbage is an activity that can also help burn calories and burn fat quite a lot. Collecting waste and throwing it has the potential to burn about 105 calories, especially if you have to empty the entire trash bin at home, which will have a big impact on the body. For those who have a private vehicle at home, burning calories can be far more maximal with the additional activity of washing a motorbike or car. Instead of having to go out of money to a special place for car or motorcycle washing, why not just do it yourself at home? 153 calories can be burned through this one activity. For those of you who like to be in the kitchen, especially doing cooking or baking activities, then one of the benefits of this is burning around 150 calories per hour. Starting from making your own pasta or bread, kneading the dough, chopping vegetables and fruits as well as others can help you stay active. Floor cleaning is an activity that can also be a helper for those of you who want to burn calories. Sweeping and mopping the floor per hour can burn about 240 calories, so this one housework is never in vain because it can be relied upon as a way to reduce weight. Every time after cooking and eating, what is done automatically is cleaning up the dish, right? The good news is for those of you who frequently wash dishes, 125-160 calories more or less can be burned through the activity of rubbing, soaping dishes, rinsing, wiping, then tidying it in its place. When washing clothes is done with the help of a washing machine, then of course this housework will not have a big effect on the body's calorie burning. But it is different from ironing clothes, because ironing is actually known to help burn up to 140 calories in the body. Many people may have complaints about this one household activity. This one job is quite difficult especially if you have a high window without a cleaning tool that can help. Actually, cleaning any window tool used can help burn calories as much as 125 calories per half hour, you know. If you have children, especially those who are still babies and toddlers, and also have pets. Bathing them is an activity that might be tiring but is actually fun and can burn about 240 calories so you can keep your weight stable. Whether it's rubbing the bathroom floor or cleaning the bathtub, apparently this activity is very helpful in burning around 200 calories. Not only that, if you add to cleaning the shower (if any), then the calories that can be burned can be more than that. The next healthy habit and can even be a helper in burning calories is tidying up the bed. Tidy up the bed is an activity that will burn up to 130 calories per half hour, so that this activity should not be underestimated as well. Rearranging your living room and bedroom can help burn approximately 260-300 calories per half hour. So when you try to rearrange furniture in several other rooms, it can be estimated not how many calories are burned? Moving furniture is quite heavy and this can be an effective household chore. For those of you who really do not have time to go to a fitness center or just run around the house, doing a series of housework can also be relied upon as an accurate calorie burner. So besides the house being much neater and better, you can also minimize the risk of causing obesity because it is always active. 0 Response to "Burn Your Calories by Working on Housework"